Activistar has been active in conducting talks, workshops and study programs on sustainable developments and living. 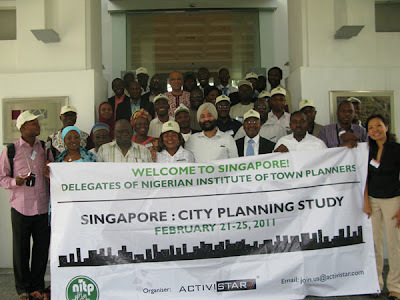 An opportunity presented by World Bank for Activistar to welcome a delegation of 36 from the Nigerian Institute of Town Planners who were in Singapore to learn about Town Planning. Our team had successfully organised a 5 full day city planning study program for the delegates who were ranged from ministers from municipalities, town planners in government sectors to private town planning practioners. Topics included public housing, transportation, parks, water management, urban security and more. Activistar was invited by UNLV(University of Las Vegas Nevada) to give a short workshop to its students on Sustainable Developement. Conducting this workshop which was more focused on sustainable hotel & resort developments all over the world to students majoring in the hospitality industry, our trainers had presented on the relationship resorts/hotels have over the environment and eco systems as well as best practices in hotel developments. Talk At GreenDrinks SingaporeActivistar was invited by GreenDrinks Singapore to give a talk on green energy living. Activistar together with partner Sunlabob shared their work on off-grid living. Remote villages in Southeast Asia which do not have access to conventional sources of power and water have to depend on alternative sources such as wind and solar as well as water filtration systems. The crowd gained new insights into living on alternative energy where we in Singapore have taken for granted.